We already rely on science to tell us what to eat, when to exercise, and how long to sleep. Why not use science to help us improve our relationships? In this revolutionary book, psychiatrist and neuroscientist Dr. Amir Levine and Rachel Heller scientifically explain why why some people seem to navigate relationships effortlessly, while others struggle. - Avoidant people equate intimacy with a loss of independence and constantly try to minimize closeness. - Secure people feel comfortable with intimacy and are usually warm and loving. --John Gray, PhD., bestselling author of Men Are from Mars, Women Are from Venus "Chock-full of tips, questionnaires, and case studies, this is a solidly researched and intriguing approach to the perennial trials of oelooking for love in all the right places&#157; and improving existing relationships." --Publishers Weekly "A practical, enjoyable guide to forming rewarding romantic relationships." --Kirkus Reviews "Amir Levine and Rachel Heller have written a very smart book: It is clear, easy to read and insightful. It's a valuable tool whether you are just entering a relationship with a new partner or-as in my case--even after you've been married 21 years, and had thought you knew everything about your spouse." --Scientific American "Anyone who has been plagued by that age-old question--'What is his deal?" --could benefit from a crash course in attachment theory." --Elle 'This is real science, not slickly packaged personal opinion.The theories are clearly explained using lots of examples. There is advice for avoiding unhappy pairings and for getting out of relationships that are doomed to repetitive, negative interaction. This could save your customers a fortune in therapy bills." --Retailing Insight "This book is both fascinating and fun. Attached will help every reader understand whom they are attracted to as partners, why, and what they can do to reach fulfillment in love. I enjoyed every moment." 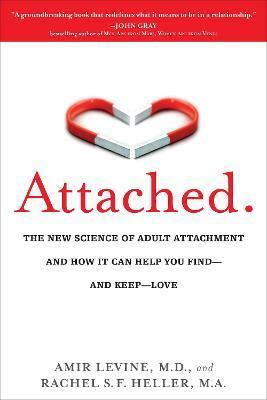 --Janet Klosko, PhD., co-author of the bestselling Reinventing Your Life "The authors have distilled years of attachment theory research on the nature of human relationships into a practical, highly readable guide." --John B. Herman, M.D., Associate Chief of Psychiatry and Distinguished Scholar of Medical Psychiatry, Massachusetts General Hospital and Associate Professor of Psychiatry, Harvard Medical School "Based on twenty-five years of research, laced with vivid and instructive examples, and enriched with interesting and well-designed exercises, the book provides deep insights and invaluable skills that will benefit every reader." Amir Levine, M.D. is an adult, child, and adolescent psychiatrist and neuroscientist. He graduated from the residency program at New York Presbyterian Hospital/Columbia University and for the past few years Amir has been conducting neuroscience research at Columbia under the mentorship of Nobel Prize Laureate Eric Kandel. Amir also has a passion for working with patients and it is in this context, while working with mothers and children in a therapeutic nursery, that he first discovered the power of attachment theory. His clinical work together with his deep understanding of the brain from a neuroscientist's perspective contribute to his appreciation of attachment theory and its remarkable effectiveness in helping to heal patients. Amir lives in New York City. Rachel Heller, M.A. studied at Columbia University with some of the most prominent scholars in the field of social psychology. She now works with families and couples as a psychologist in private practice. Rachel lives in Israel.